Khine’s numbers call into question the economic-development priorities of Virginia’s non-metropolitan areas which continue to invest resources in building a manufacturing base as well as the Northam administration’s well-intentioned goal of ensuring that no region gets left behind economically. Textiles and apparels, once a dominant industry in Virginia, continued their precipitous fall — 83% for textile mills and 87% for apparel. This sector now totals for only 4,500 employment. Furniture employment was down 55%, metals down 57%, printing down 47%, petroleum and coal products down 46%. The losses have been most dramatic in the Martinsville-Danville (West Piedmont) workforce investment area and the South Central region. Looking ahead, the VEC projects the greatest manufacturing losses in the New River, Lynchburg, South Central and Northern Virginia regions. The losses in Northern Virginia are no surprise, and not a thing to be particularly concerned about. High-wage high-tech and corporate HQ activities have push the cost of business and cost of living so high that lower value-added activities like light manufacturing have been displaced. But losses in local manufacturing jobs can be made up through an increase in retail- and service-sector jobs. The job losses downstate are more problematic. There is no obvious alternative source of jobs for small mill towns. Smyth County: Scholle IPN Packaging, Inc. to create 42 new jobs. Caroline County: M.C. Dean, Inc. to create 100 new jobs. Rockbridge County: Dynovis, Inc. to create 44 new jobs. Frederick County: The Clorox Company to create 100 new jobs. Botetourt County: Pratt Industries, Inc. to create 50 new jobs. That’s not bad for one month. Those announcement, creating a total 336 new jobs, beat a poke in the eye with a sharp stick. But, annualized, the deals account for just over 4,000 new jobs for all of non-metropolitan Virginia. Virginia’s small communities have limited resources to waste, but they’re betting on a manufacturing renaissance that likely will never occur. With a few few exceptions such as Southwest Virginia’s cultural heritage trails, they have given precious little thought to any alternative model of development. Nor have they given much thought about how to shrink gracefully — maintaining the quality of government services for a smaller population and with fewer resources. Virginia is a diverse state, and some parts of the Old Dominion have greater potential than others. The Northern Piedmont region, led by the Piedmont Environmental Council and the Journey Through Hallowed Ground, have several important advantages: proximity to the Washington metropolitan area, a rich historical heritage, and beautiful vistas. The region has attracted large numbers of wealth people who are willing to invest there. No other Virginia region can replicate the Northern Piedmont’s unique mix of resources. But the Shenandoah Valley has farms, mountains, vistas, and history. The Tidewater counties along the Chesapeake Bay have access to river fronts and the Bay. Southwest Virginia has mountains, hiking, kayaking, and rock climbing, along with a unique cultural heritage. These assets can support retirement communities and a modest amount of tourism — admittedly, a pale substitute for tens of thousands of factory jobs, but industries that can provide some jobs and a more enduring economic base than a light manufacturing facility that may be gone in 10 years. Rural America is hurting. But it’s not hurting everywhere. There are pockets of prosperity. What are other places doing that Virginians are not? What economic drivers might exist beyond manufacturing, call centers, small-scale tourism, and retirement communities? What other strategies might Virginians pursue? We don’t know because we haven’t bothered to look. But time is running out. If the VEC is right, the manufacturing jobs are not coming back. And who looking in from another state can be confident of the supply of natural gas? So far Northam and Herring are keeping steady under fire, but there is no sign it will let up. No, Virginia is not a magnet for manufacturing. By this time next year, bye bye right to work? I thought natural gas might be a plus for rural Virginia in attracting industry but it seems like the idea is to bypass the rural and move it further east. Solar is not unreasonable especially in existing brownfield sites and abandoned coal sites. Last year, 264,000 new manufacturing jobs were added, representing the highest number of new workers since 1988. As a percent of the total workforce, manufacturing rose for the first time since 1984. This is how Trump won – and it’ll be interesting to see if RoVa still believes that Trump “delivered” and Northam “failed”. Having grown up in a rural area, I worry about these places. Jim has posed some good questions. Is VEDP spending any energy or resources on coming up with a strategy for rural Virginia or they spending all their time on the glamor projects such as Amazon? The Governor’s proposal to use some of the windfall revenue to extend internet broadband to these areas would have helped. Seems like for a LONG time – we’ve had economic stress in the rural areas of Virginia that has spanned many administrations – Dem and GOP. The hollowing out started decades ago when the furniture and textile industry started going away – rural America. In addition, small manufacturers that located in small towns and cities that had rail access also went away. with the town growing up on both sides of the track. The towns still exist and the rail still goes through but the industry associated with it is gone and even farming has declined. Stores that used to sell stuff the train delivered, like appliances and hardware also closed. A nearby example of one of these towns is Ashland, just north of Richmond. 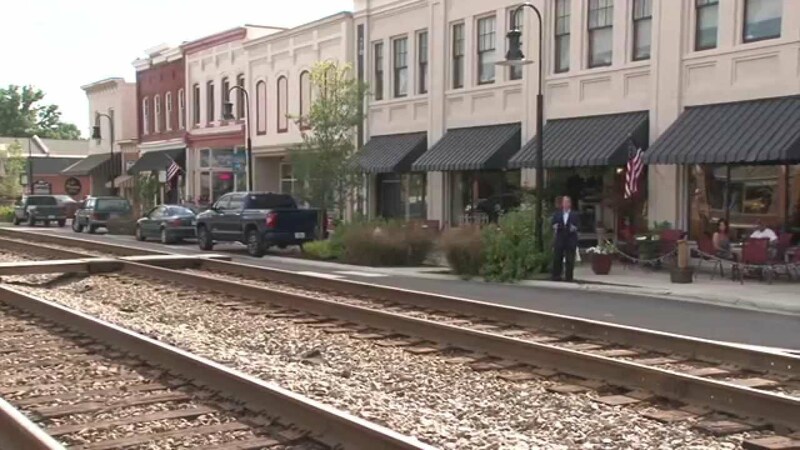 CSX and Amtrak still go right through the middle but the shops are either side now are mostly boutique. That’s about the same employment forecast as for manufacturing in the U.S. overall. In general, the story of manufacturing is one of growing productivity (via automation and other means), and with it, declining total employment. One can find manufacturing sites across Virginia (and America) producing output at an all-time high with employment well under half of the all-time high. I think the first statement is too strong, and I disagree with the second. If we were to address our state and local competitiveness issues for manufacturing investment (see examples below), I think we could beat the manufacturing employment forecast by a substantial margin. Keep in mind that just 100-300 additional jobs per year in each small metro and rural region of the Commonwealth would be enough to position every region of Virginia for growth in total employment. Right now, the Northern Neck, the coalfield region, and southside are the areas most at risk of an employment decline in the decade ahead, according to forecasts by Moody’s Analytics. Georgia and Louisiana (and to a lesser extent South Carolina, North Carolina, and Alabama) offer customized, turnkey workforce recruitment and training solutions for manufacturing expansions and new manufacturing locations. Such programs are particularly helpful for rural areas and smaller metros where workforce availability often is of greater concern to prospects. With funding from the General Assembly, we are about to create just such a program in Virginia, in close partnership with VCCS. We just recruited one of the top custom workforce development experts in the country from Georgia to run the program — Mike Grundmann was recommended by the two titans of custom workforce solutions in the South (Jackie Rohosky in Georgia, and Jeff Lynn in Alabama, formerly of Georgia and Louisiana). Mike will be starting next month, and we expect to have this program fully up and running by late this calendar year. Other states have made substantial investments in prepared sites and buildings for manufacturing projects. The most common reason we lose a manufacturing project in Virginia is that another state has a better prepared location. With new funding from the General Assembly, we are about to characterize roughly 400 potential manufacturing sites across Virginia, and we expect to begin preparing many of them for projects starting in 2020. Other southern states (e.g., NC, SC, GA, AL, LA, MS) typically offer far greater incentives for competitive manufacturing projects than Virginia. While we don’t have a systemic solution to address that issue, we have been able to make competitive offers on a case-by-case basis for larger projects. I think you will see us win more of the big advanced manufacturing projects as a result. We don’t lead with incentives, but we have to recognize the competitive landscape. Other states have been marketing their manufacturing assets more aggressively than Virginia, which for the last few years (until the current fiscal year) had a zero marketing budget for economic development. With new funding from the GA, we are ramping up marketing efforts this year. I expect we will be seeing greater awareness and more leads in the near future. Many other states offer lower state/local tax burdens for manufacturing expansions and new manufacturing locations. While Virginia’s localities often will offer some kind of M&T relief, Virginia often does not make it to the shortlist to have the opportunity for a locality to negotiate something on a case-by-case basis. Likewise, at the state level, we lack the kinds of Quality Jobs incentives for new manufacturing projects (basically partial payroll tax rebates in the first few years of operations for qualifying manufacturers) that have helped other southern states to frequently secure far more projects than Virginia in the manufacturing sector. The lack of those two tools means state/local tax burdens in Virginia for new manufacturing projects (including expansions and new locations) often are higher than in our competitor states. Those are probably the top examples. Custom workforce solutions, site preparedness, and marketing are actively getting addressed. The FastForward program at VCCS also is helping on the workforce front. Incentive challenges are being addressed on a case-by-case basis for larger projects, but more can be done there. Targeted business tax reform is yet to be tackled. I also think there is more good work to be done with placemaking, particularly in historic downtowns. DHCD and some localities are doing important work in this space, and we think there will be opportunities for VEDP to assist, particularly with tech-related jobs (see below). One other driver beyond manufacturing that we think holds great potential in Virginia is small metro and rural tech centers. Think of CGI in Lebanon, for example. We are actively cultivating several projects in that space. The new tech-talent investment program coming out of the Amazon HQ2 project will help open up new tech-related opportunities across Virginia (about half of the new investments in computer science programs will happen outside of NOVA). These tech projects may be small to start, but they are real and represent part of a fast-growing segment of the U.S. economy. With focused effort, we can position every region of Virginia (although not likely every locality) for growth in the years ahead.